This chair did not disappoint, was a breeze to assemble and keep clean, and kept a squirmy toddler safely in place. At first glance, we wondered if the seemingly small and overly simple Baby Bjorn high chair could indeed handle the full range of occupants it claims, from baby all the way to toddlers pushing the upper age limit of three years old. We quickly realized that not only did our older baby fit in this chair just as well as our favorite (and much larger) Peg Perego Siesta, but they did so with ease. The smaller space just meant that there was no extra space to collect food, or worse, squirm free. The stylish design uses the tray for a dual purpose, integrating it as part of the baby's restraint system, which is vital since this only has a 3-point harness and there are no shoulder straps like on many other high chairs. The chair, made from durable, chemical-free plastic, is effortless to wipe clean and has no crevices allowing food to hide. Best of all, it folds nice and flat for storage and can be used for travel in a pinch. Read on to discover more about why we gave this little powerhouse an Editor's Choice Award. The sleek and stylish Baby Bjorn high chair is one that will quickly become a favorite in your collection of baby equipment. With its simple black-and-white design, it is bound to blend seamlessly with most kitchen and dining room decor without looking flashy or childish. Although if it ever seems like it's getting in the way, or you need to bring it with you for a long weekend, no problem. It folds to an astonishing 10" deep, and you can easily store it in the pantry, closet, or trunk of a car. 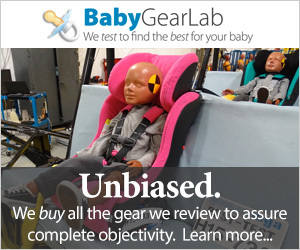 Our baby tester was always fully supported by the 3-point pelvic belt and tray, and we found that we didn't miss the shoulder straps found on a 5-point harness. Keep this chair clean by just wiping it down, and snapping off the snack tray for a quick wash in the sink. Then all you have to do is sit back, relax (ha, ha!! ), and wait for the next feeding! Although the tray on this super-compact chair is on the smaller side, it still easily held a standard toddler-sized plate. Baby Bjorn was created in 1961 by a man named Bjorn Jakobson and remains a family-run business to this day. Bjorn and his wife, Lillemor, still play an active role as CEO and head designer of the company. They uphold their committed to providing long-lasting products that will stay in excellent condition, as they believe that having children shouldn't require you to buy a lot of "stuff". They stand behind their core principles of safety, quality, and style for every product they manufacture, starting back with their first baby carrier in 1973. The Bjorn is a perfect compact addition to your baby gear needs, beating out much of its competition. Truly, the Bjorn performed well all around in this category. The tray has a large knob underneath that you squeeze and then turn to release down, and then squeeze and turn again to lock it back in the upright position. This aspect of the chair is very intuitive, and we quickly figured it out. The straps come together to form a straightforward 3-point pelvic belt that is easy to buckle and adjust. The sturdy fabric behind the buckles helps to avoid any pinches. Behind the buckle is a nice sturdy piece of fabric with soft backing that will protect your baby's belly from any pinches. However, the buckles do not feature a one-hand release, like our other Editors' Choice Award winner, the Peg Perego Siesta making it slightly less convenient. This chair does not accommodate newborn infants, but will adequately support your baby from 6 months up to three years of age. Our baby sat in a nice, ergonomically correct position, with her feet resting nicely on the footrest and her back supported by the sleek, rounded design of the chair. What we found that wasn't so intuitive was the two-step fold process. Luckily the instruction manual is very clear and helpful with this process. Room to spare! Even at 24 pounds and 31" long, baby still had plenty of leg room under the tray of the Bjorn. Our ease of use metric also accounted for how well the chair accommodated baby throughout different stages of development. It was this area where other reviewers felt the Bjorn may have lacked, with some commenting on how it did not fit their child who was 37" long. The manufacturer clearly states that this chair is for children under 38" tall, so at only one inch under the limit, we would expect a child to be pushing the envelope. Our baby tester, however, was only 31" tall at the time of testing, and had at least 2.5" of space between the tops of her knees and the bottom of the tray (while her feet were flat on the footrest). Therefore, this was not an issue for us, but keep in mind that once your child reaches around 37" long, you may find leg space to be an issue. When it comes to ease of cleaning, this chair blows away the competition. It has absolutely no crevices for food to get caught in, no big base for food to land on, no cushions to stain, and no inserts to lift up or remove and machine wash. Just wipe down this chair when your baby is finished eating, and you're good to go until the next meal. It's tray depth adjustments even allow you to put the tray nice and snug against baby's belly to prevent extra crumbs from finding their way down to baby's legs, keeping baby cleaner as well. The snack tray easily snaps off with two hands if you'd like to remove it for a wash before taking baby out. There is no need to lower the main tray to remove the snack tray. With the black snack tray removed, the entire chair is simple to quickly wipe clean. Not surprisingly, this chair also delivered regarding quality. It features just exactly the right amount of chair while still maintaining the smallest footprint and most lightweight material possible. All this while keeping baby safe and secure. Don't let the small size of this chair be mistakenly interpreted as less stability, as it was certainly sturdy enough to handle our squirmy toddler. Our little one was always properly supported and restrained by the 3-point harness, and the seat depth and curved back seemed almost custom-fit to our toddler tester. Lastly, the tray and crotch post, a feature unique to this chair, stayed attached to the chair as part of the restraint system itself. Since the chair does not have a recline feature, and your baby sits upright in an ergonomically correct position, there is still no danger of baby slipping once you release the tray down. The Bjorn was a breeze to set up. Just snap in the four leg posts, and it's time to eat! The instructions provided by the company were relatively simple to understand, and our total setup time for this chair was a whopping 2 minutes 39 seconds. Not too shabby. In fact, it probably took us longer to figure out how to tip the tray up for folding than it did to assemble the entire piece. The slim profile shows just how easily this chair can be stored away when not in use. This chair will only take up about 454 square inches in your kitchen, and very little space when folded up inside the pantry or closet. Like several of our other chairs, it does not have wheels. Some others, like the Keekaroo Height Right, earned themselves a couple of extra points for the ability to slide across the floor, even without wheels. However, this is not the case with the Bjorn. The actual feet are quite small, and we could not slide it around our tile kitchen without those tiny feet getting stuck in the grout lines. But weighing in at only 10.6 lbs, it is easy to pick up the chair entirely to move it from place to place. However, you should do this before you secure your baby in the chair, as trying to slide it around afterward can create a tipping hazard. And of course, always follow the safety guidelines in the owner's manual provided by the company. Regarding overall portability, you won't find a full-size high chair more portable than the Bjorn. If you are still unsatisfied, you are probably actually looking for a travel booster seat (in which case, you should check out our review on The Best Portable High Chair). This chair is best suited for someone who is looking for a quality, reliable seat that has a minimalistic design while still getting the job done. Some users were put off by the small size of this chair, so consider this your "warning": This chair is small. But do remember the adage: Good things come in small packages, and in the case of the Baby Bjorn high chair, this remains true. With a $300 list price, this is one of the most expensive chairs we tested, but its simplicity, performance, style, and quality made the price worth it, in our opinion. Although at first glance this chair seems small, it is actually built to accommodate toddlers, and does so quite well! In conclusion, this is a quality product that is well worth the money in our opinion. It is a product that will last you just about until your child is ready to sit in a regular chair around the dining table. It doesn't have any of the fancy frills and features that some of the other chairs offer, but that is not necessarily a bad thing. It is meant for one task and one task only: eating in an ergonomically correct position, and it does this extremely well. There will be no doubt in your baby's mind that it is time for food and only food, as this is not a place for napping, playing with toys, or just hanging out. You will most definitely enjoy the simplistic, no-nonsense nature of the Baby Bjorn while your child is little. It will be a haven of ease and simplicity in a time when you have lots of other distractions going on. At this time, Baby Bjorn offers only one high chair in two color options: light green and white. There is a BabyBjorn Booster Seat for when baby outgrows the high chair and is ready to sit at the table with the grown-ups.